Retail Space for Rent: Take a Look at Our 42 Broadway Space! 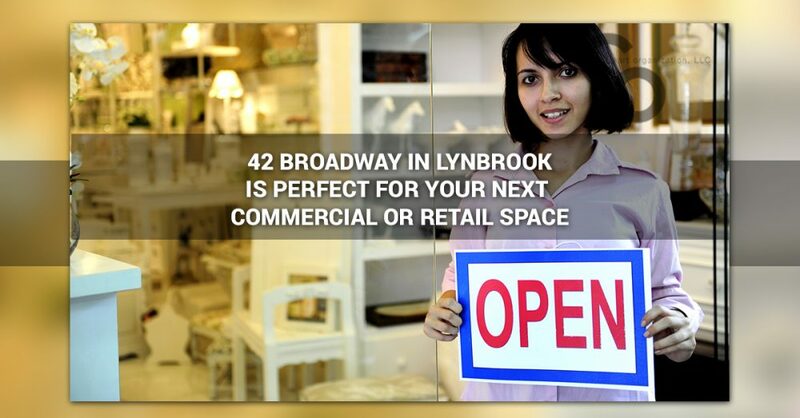 42 Broadway in Lynbrook is Perfect for Your Next Commercial or Retail Space! A good team of real estate agents will do everything they can to ensure their clients have access to all of the space they need to set up a business. Whether it is developing a presence in the merchandising world with a wonderful retail space or ensuring you have a large commercial property with enough office space for all of your employees, finding the right property is important. If you’re in need of a property in the Long Island area, then Chart Organization has the perfect spot for you. The storefront at 42 Broadway in Lynbrook is an ideal spot for any business or enterprise looking for a retail rental space. Whether you are just starting out, relocating, or opening another location for your business, this space can be the answer you’ve been looking for! If you have questions regarding this property, please reach out to the team here at Chart Organization and see how we can help. When opening a new storefront, it’s important that you know you won’t be lost in a flurry of other businesses. It is also important, though, to understand the need to stand out amongst the potential competition. With it’s location, the rental property at 42 Broadway is ideal for your next storefront or commercial property rental. Sitting just a block away from the highway, this is a corner space in a small strip building, giving you maximum visibility from nearly any angle. It also houses a parking lot, which is more than difficult to come by in New York. With several other local businesses and nationally recognized names situated around this retail rental property, being nestled amongst blocks of other businesses means visibility and plenty of foot traffic. Chart Organization has a network of rental properties for our clients to choose from. A common practice we often see is business owners looking for a way to separate their office from their storefront. This can often mean looking for office space for rent nearby but having to settle for a more cost-effective option a long ways away. Some folks might like the idea of having the office in the same rental space as the retail storefront, but this can cause countless distractions that prevent owners from taking care of the clerical and behind the scenes agenda items. Thanks to the careful planning and strategies the team here at Chart Organization has employed, you can avoid that when renting the 42 Broadway space for your retail or commercial property needs. Located just feet away is another building at 50 Broadway that houses another of our quality offices spaces for rent. If you’re inclined to separate your office from your storefront, you have that option here! Both of our Broadway rental property listings gives business owners the opportunity to rent two spaces feet away from each other, while still keeping the administrative and client-facing sides of their businesses separate. It’s a great option for those who need the dichotomy without having to drive across town. Do you have questions about our property at 42 Broadway in Lynbrook, NY? Wondering what the advantages are to possibly renting the space at 50 Broadway as well? Luckily for you, you have access to one of the finest real estate groups around. Here at Chart Organization, we ensure every interaction with our clients is memorable for its cordiality and commitment to customer service. Feel free to reach out with any questions or to get started. Get in touch before your favorite property is gone; call today!